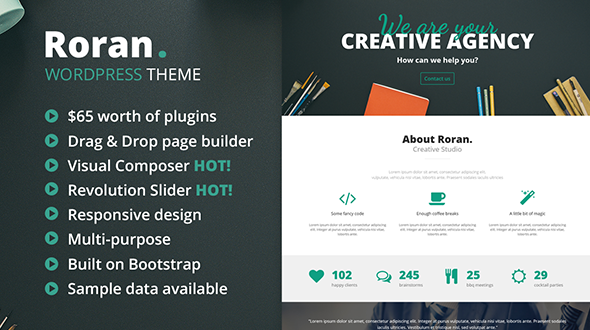 Roran is a clean, modern, easy-to-use and multi-purpose one page WordPress theme. It includes $65 worth of plugins. It’s responsive and ready to use for any type of website. It is presented as a creative agency or personal portfolio but can be use for nearly any one page website. Sports, business, lawyers, automotive, cosmetic, health, … anything is possible. It’s is fully customizable through WordPress Customizer (prefered by WordPress.org), Visual Composer (and extra Elite Addons) and Revolution Slider.
? Installed and set up in 5 min. Images used in the live preview are not included in the demo!